For a while in the early 1990s, I went through a period where I did a lot of traveling. Between school and family trips, I visited a lot of places that had gift shops. 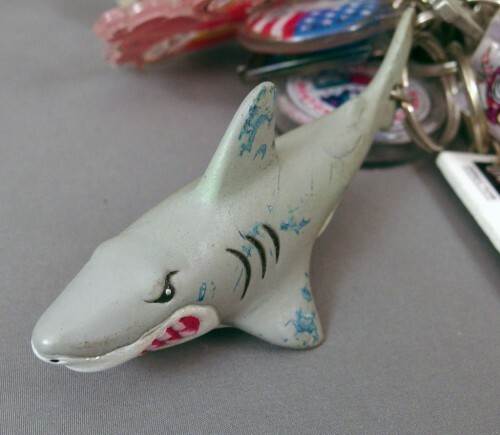 Being the sort of person who needs a trinket, memento, bauble, trinket, knick-knack, or totem to commemorate every single thing that happens to me, during this time I had decided to collect keychains. This wouldn’t last – primarily because I stopped traveling as much – but it left me with a decent collection of keychains circa 1991-1994. And lucky you, you get to read about every single one of them! A lot of these came from a single trip to Florida in 1992, which I mentioned a while back when discussing that JAWS ride souvenir. My mother’s side of the family was having a reunion, and since my grandparents lived in Florida and were hosting the reunion, my parents decided to take an extra week off and visit Disney World, Sea World and Universal Studios Florida. I recall being very into Star Wars during this time, for whatever reason (future Star Wars periods would include 1997, 1998-9 and then nothing until, well, now). But I digress – let’s get to the keychains! 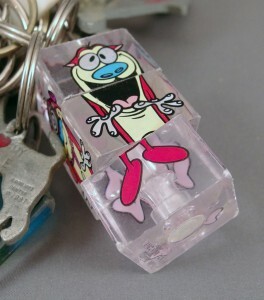 I was really, really into Ren & Stimpy in 1991-2, so it’s no surprise I nabbed these. I’m pretty sure I got them at Universal Studios, which had some sort of Nickelodeon connection at the time (and maybe still does? I’m not going to check, that sort of thing really breaks my concentration when I’m trying to write one of these articles). They’re neat because you can rotate the PMMA blocks to change the character’s clothes and expression. 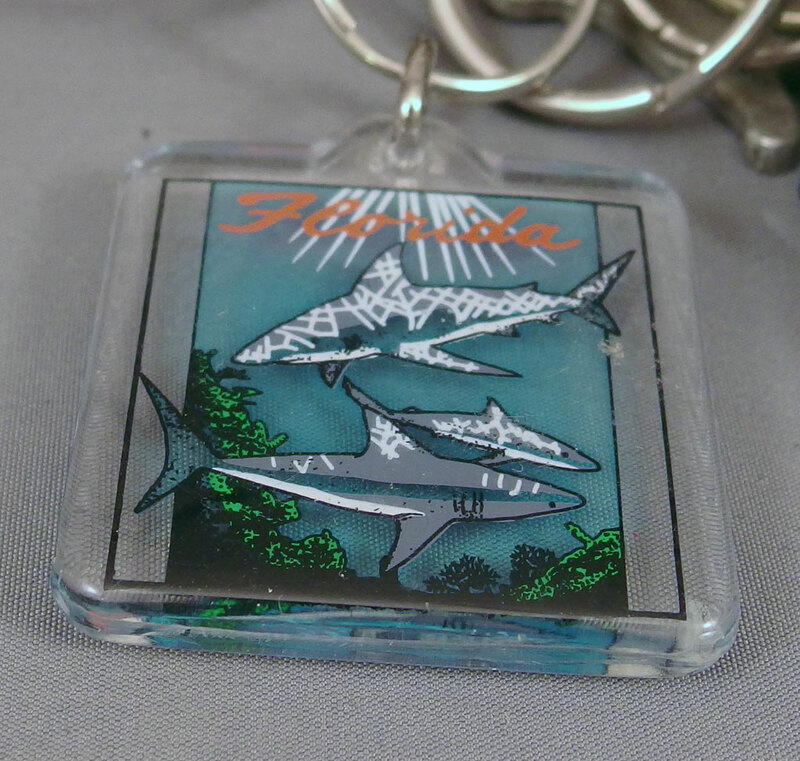 These are easily two of my favorites from the Keychain of Keychains. 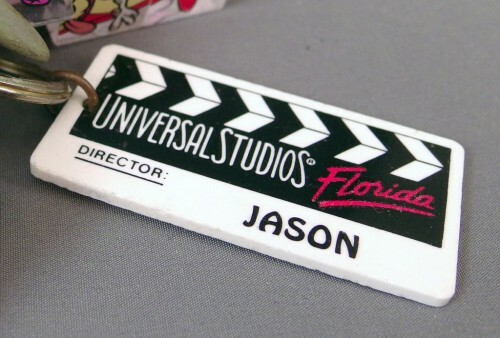 This one is definitely one of those “Okay, now I need something generic with the name of the place I visited.” I really did love visiting Universal Studios, though. Going on the JAWS ride was an experience I had to have. 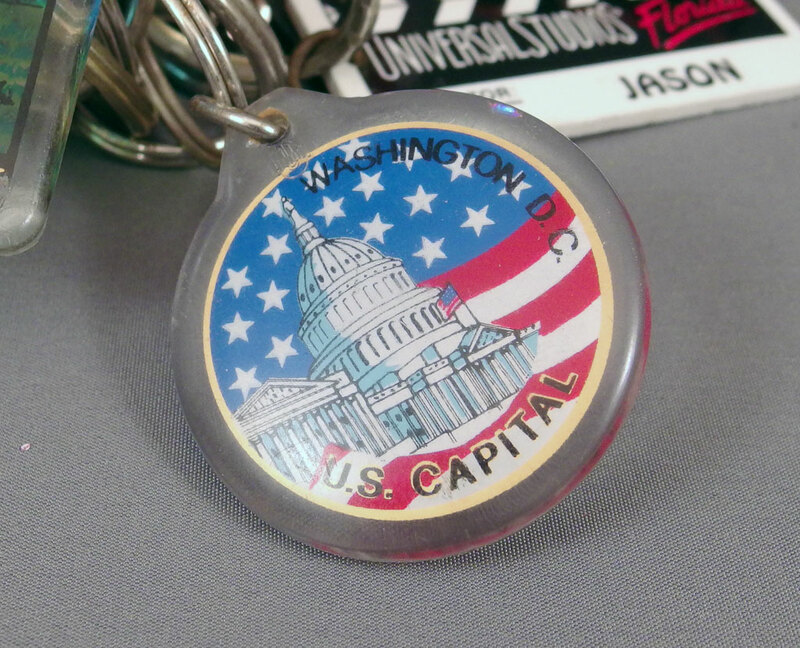 Anyway, this keychain isn’t all that interesting. The only thing I remember about our trip to Sea World was going on the awesome Mission: Bermuda Triangle simulator ride. Simulator rides were a big thing at the time, following the success of Star Tours, and they were easily my favorite rides during that trip – I went on Star Tours two or three times, and Mission: Bermuda Triangle and Body Wars at least once apiece as well. They really fired my imagination. 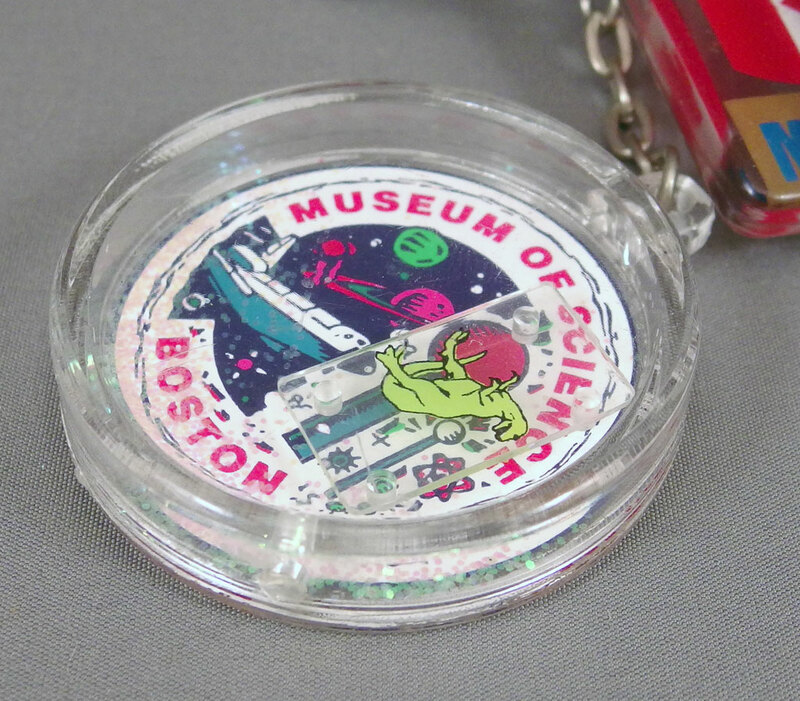 I used to go to the Boston Museum of Science on a regular basis as a kid. I haven’t been in years, but if and when there is a little Poe offspring of some sort, I hope to start visiting again. 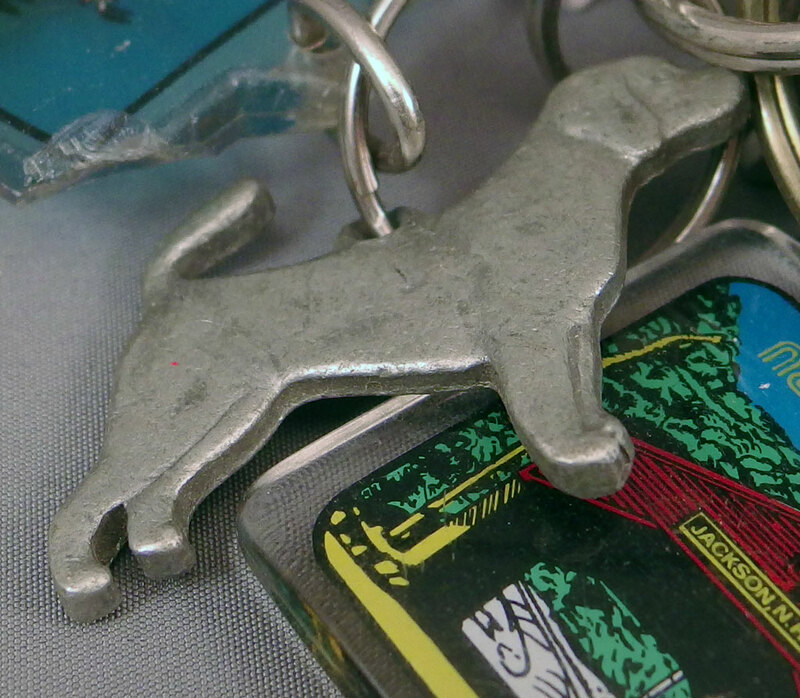 I’m not sure what the deal is with this keychain – if it’s a game or just some sort of floating bits. Note the upright pose of the Tyrannosaurus and the Space Shuttle – both things that have been retired. 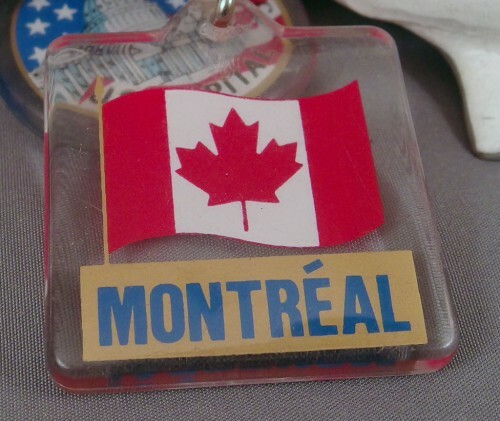 In high school, we took a class trip to Montreal. I can remember hardly anything about this trip except the awesome jet boat ride we all went on, in which the girl sitting next to me peed her pants, but it didn’t matter since the boat was half-swamped with water by the time we got back to port. I think the trip took place in eighth or ninth grade. We also took a class trip to Washington, D.C., and I’m guessing it had to be in ninth grade, because a.) I know I wasn’t dating my high school girlfriend yet, because I remember spending half this trip taking secret, stalker-y photos of another girl I had a crush on, and b.) I distinctly remember introducing a friend to Nirvana’s Nevermind during that trip, which he proceeded to listen to non-stop the entire time, and I didn’t become friends with him until at least late ninth grade at the earliest. Anyway, aside from the aforementioned stalker-y photos, the only other things I remember about this trip was visiting the Washington Monument and taking way too many photos of it. Here we go – now we’re getting somewhere! 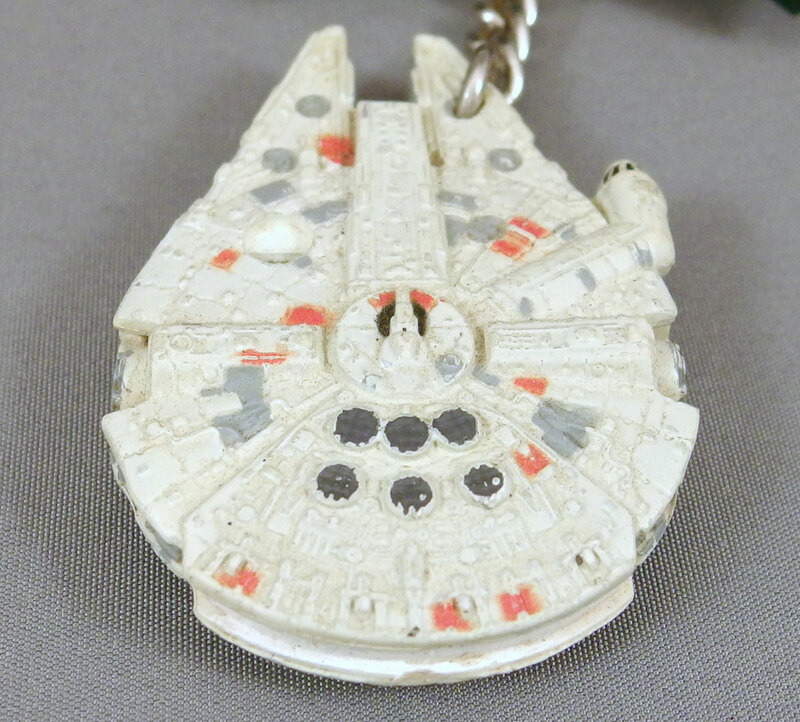 I’m pretty sure this Millennium Falcon isn’t an actual keychain, but a Micro Machines Falcon that I drilled a hole through and attached to one. I think I wore it as an actual keychain for a while and then retired it to the Keychain of Keychains after the saucer dish came off. 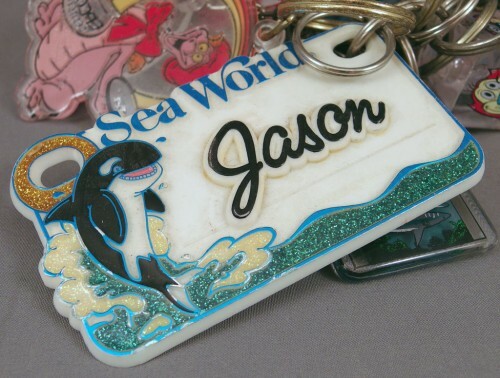 Here’s another one of those lame nametag keychains to prove I went to Disney World. I’ve never understood the appeal of Mickey Mouse. Did I mention I really loved the JAWS ride? Note that I was a good five or six years from being able to drink when I got this. I really loved the JAWS ride. No idea what the blue gunk all over the shark is, though. I’m sure I nabbed this somewhere during that 1992 Florida trip. I’ve always loved sharks. 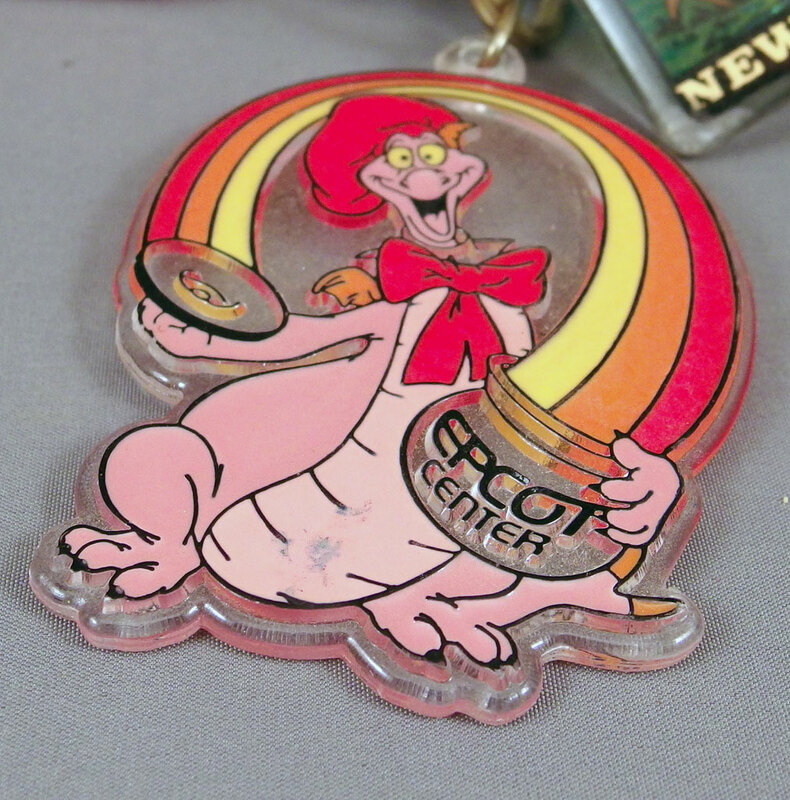 I’ve also always had a soft spot for Figment from Epcot Center. 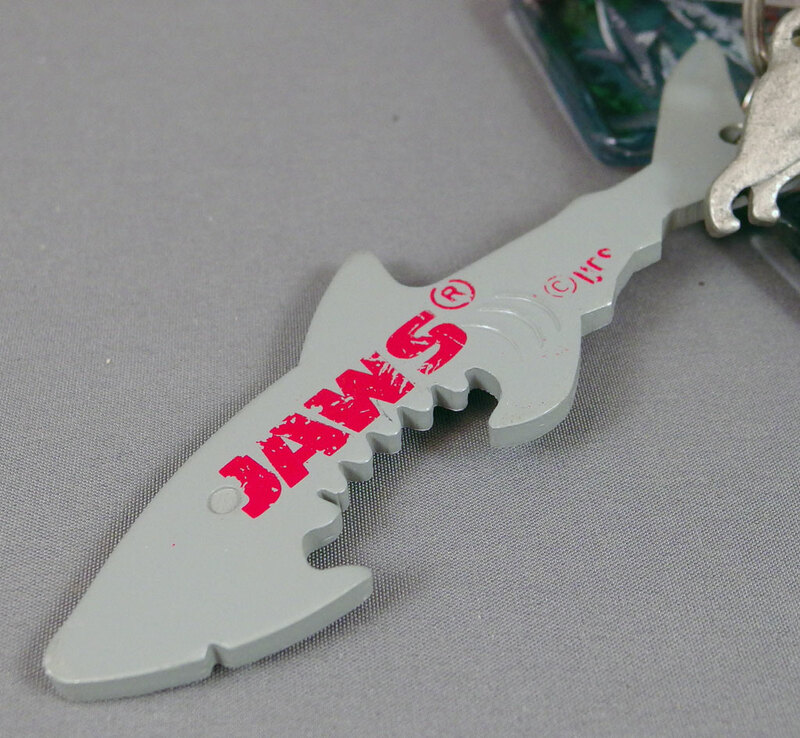 This is a pretty lame keychain, though. Apparently I went to New York. 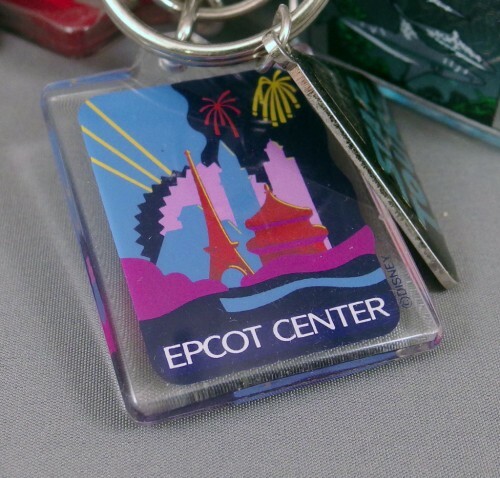 Another Epcot Center keychain. I find myself wondering, was there not a round keychain of Spaceship Earth? There must not have been, otherwise I would have bought it. I realized after I took all these photos that I forgot to take a separate photo of the Star Tours keychain, which you can see just to the side of the Epcot Center one. I think of all of the keychains here, that might be the one I’d actually consider using right now, for fun. Yes, Poe, you went to Walt Disney Studios. Mickey must have been really busy on this shoot, both starring and directing. We had two beagles – well, a beagle and a beagle mix – growing up. And so I bought a keychain. My family drives up from Massachusetts to New Hampshire once or twice a summer for vacation – it’s been going on since my dad was a kid. Another class trip, this one to a band/chorus competition or something that was hosted at Hershey Park, Pennsylvania. This was very late senior year of high school. Note that I went with my then-nickname “Jay” instead of “Jason,” just to mix things up a bit I guess. Or maybe Jason was sold out. This is probably the coolest keychain of the lot. This isn’t just a Back to the Future keychain. 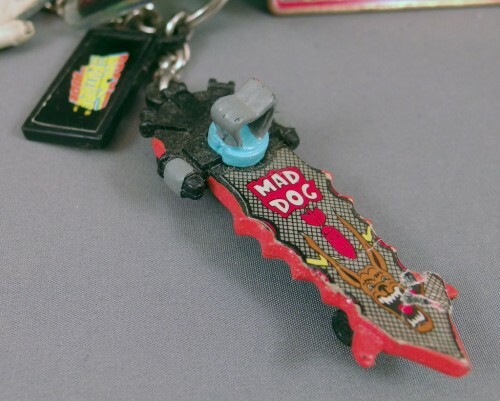 It’s not even just a BTTF keychain of the awesome, badass hoverboard used by Griff Tannen, Biff’s son who chases Marty McFly’s son in Back to the Future II. No, it’s based on a version of Griff’s hoverboard that didn’t even make it into the movie! The one in the movie had “Pit Bull” on it – this earlier design had been intended to foreshadow “Mad Dog” Tannen from BTTF 3. 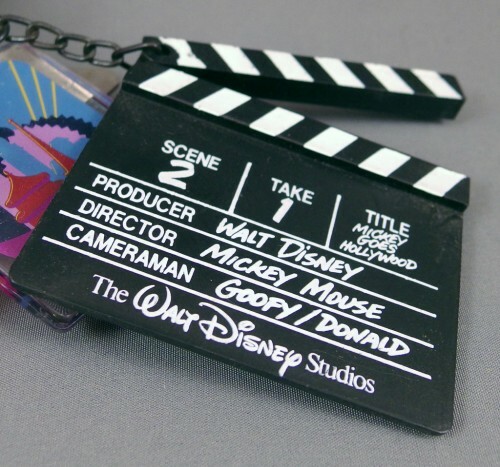 I would never keep this keychain in my pocket. It’s pointy. This one bums me out a bit nowadays. 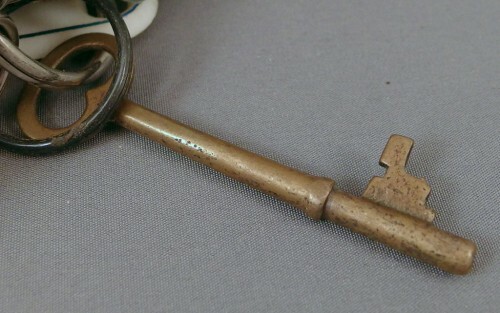 I love the story behind it – I found this key while swimming in a local pond. I was in the water, brushed my hand past something on the bottom of the pond, and came up with a skeleton key. I was about twelve at the time – maybe even younger – so my imagination went wild with the possibilities as to what this was meant to unlock. A door to a mystical world? A chest containing pirate gold – you know, those pirates who hid their gold in the South Shore of Massachusetts? I wore this on my keychain for quite a while, but at some point one of the teeth chipped off, and being the perfectionist that I am that just ruined it for me (this is a common situation with many of my action figures as well – if something breaks, even if it’s easily glued, it tends to bother me and I often will buy a new one if one can be found for cheap). And that’s it! 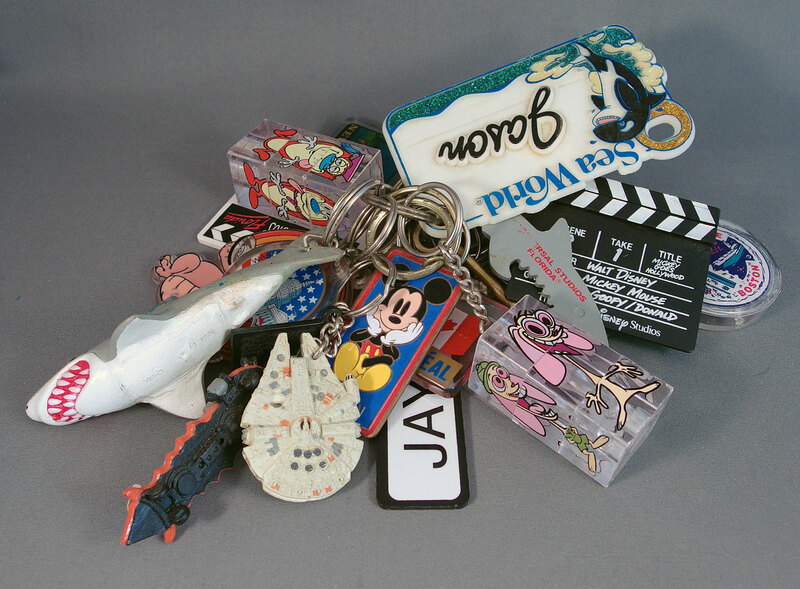 My keychain-collecting era lasted from about 1992 to 1997. Five years isn’t bad for a hobby, considering my tendency to drop fads like a hot potato every year or two. I’m not sure what I’ll do with these now…they’re probably destined for a junk drawer, perhaps for the rest of my life, to be discovered when my descendants are cleaning out my things after my death, and then tossed in the trash or sold on eBay or have their plastic recycled in the house 3D printer. Or maybe I’ll start collecting keychains again someday. 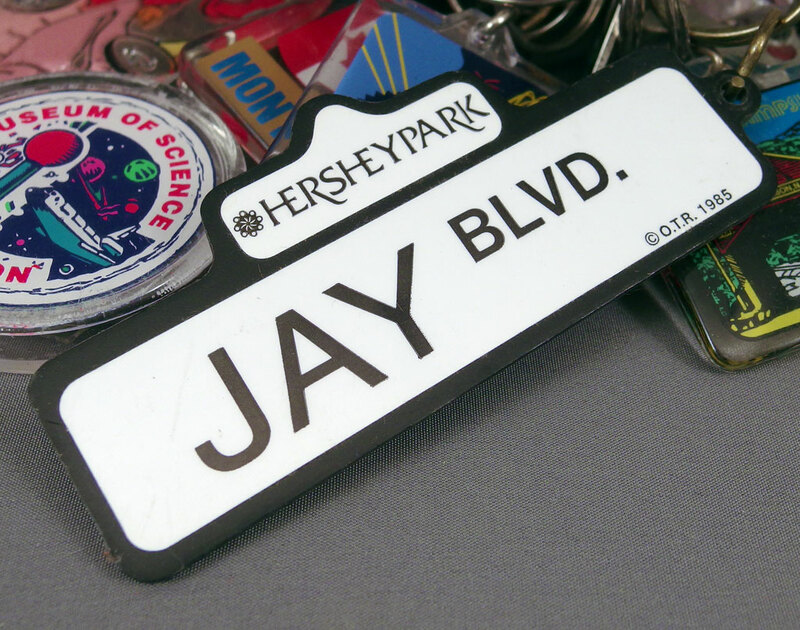 Back to the Future, beagles, Boston Museum of Science, Disney World, Epcot Center, Figment, Florida, Hershey Park, JAWS, Mickey Mouse, Montreal, New Hampshire, Ren & Stimpy, Sea World, sharks, Star Wars, Universal Studios, Walt Disney Studios, Washington D.C. I think I like this feature more than Toy Aisle Trolls!! And there is PLENTY of material up in the attic to keep this going for years! 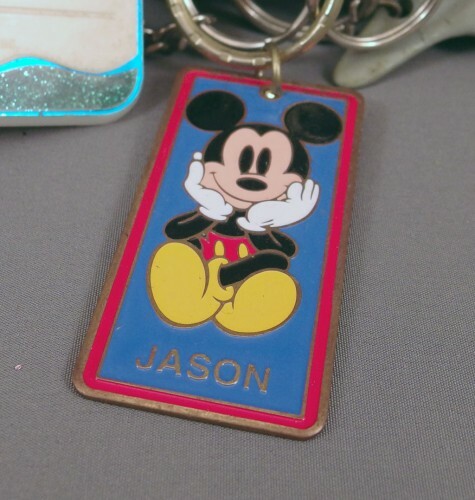 I had a gigantic keychain collection as a kid, too (even had the Mickey Mouse one [I, too, fail to see the appeal of Mickey Mouse]). 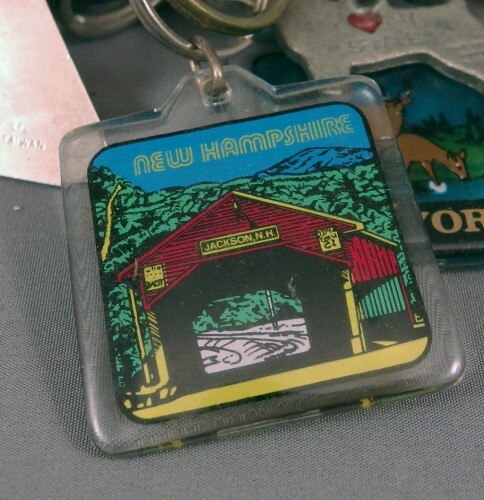 Mine, though, had fewer "places I'd been to" keychains & more of the "I got this for free at the auto parts store" type. I had that same Mickey Mouse keychain as well. I, too, have a random ancient skeleton key on my key chain! 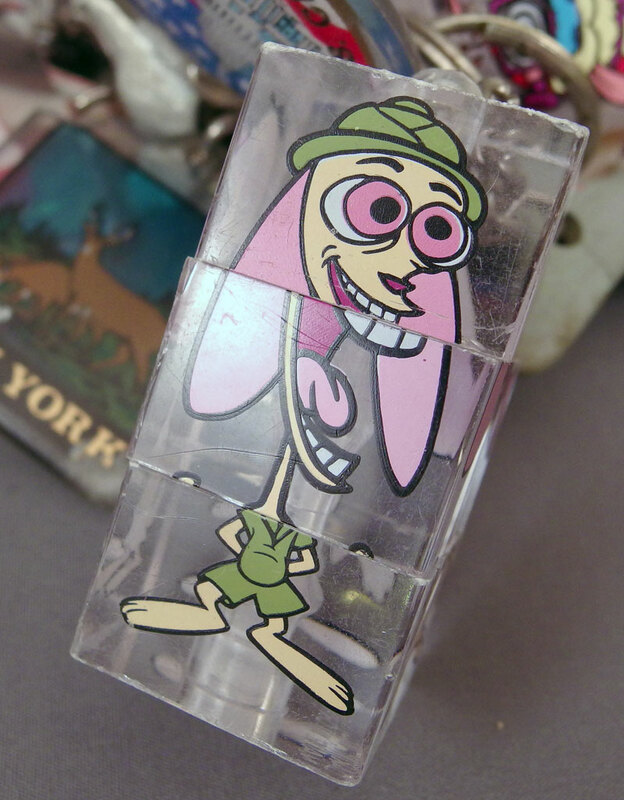 Holy mercy, I had those Ren and Stimpy keychains! I had tons of R&S merchandise, actually. My friends and I were crazed fans. Also, watching a two-hour compilation of episodes while under the influence of LSD is very interesting… or so I'm told. i didnt have a keychain collection really, but i had a crazy amount of random keys. then the bucket they were all in got water in it and they got nasty. then i realized keys are not that cool.